"No one can know the real Rekha, because the real Rekha lies somewhere in her fantasy" ~ Simi Garewal. 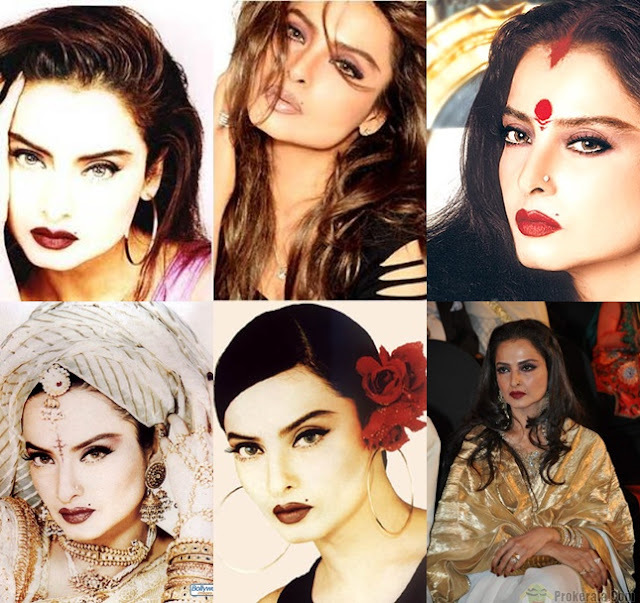 Today is our very own Indian beauty icon, Rekha's birthday. She turns 56 today, but the diva in her has not withered at all. She's glamorous, classy and always very composed. Her tactfulness when talking about the difficult life she's had is admirable. Unique brows. Her brows are never over-tweezed or rounded. They are almost straight with just a slight arch. Pouty Lips. Almost always with dark lips: Red, brown, burgundy, her lips always stand out. Use a lip liner and line a little outside your lips to make them appear fuller. Beauty spot. Her most famous trademark on her left upper lip, although sometimes it is seen on the right side. I used L'oreal Super Liner Carbon Gloss coz it has a stiff pointy brush for control, and then I patted a bit of medium brown matte eyeshadow on top. Are there any Rekha fans out there? Do drop your own birthday wishes to her below. i love your first pic... you are soo close to her look !! Hahahaha...I know. Umm...that's what I read on wikipedia, who knows..
Wow Cynthia, you look so like her. Esp the red lips. Awesome job. Not many Rekha fans here, I see :). I wouldn't say I'm a big fan, but I admire her. I loved your imitation :) u look great. Can you please tell me which white eyeliner you used for the look? You know how to do it, lovely! 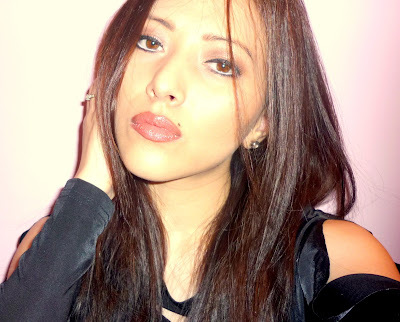 Hey Vinitha, I use Maybelline Lasting Drama Gel Liner on top & IN2IT Gel Liner Pencil on bottom. The white one is a Rimmel Two-tone eye definer in Trend Setter. Yay! Seems ur a big fan of her's :) n so is yr dad huh? lol...she was a big hit back then, who wasn't in awe of the Rekha transition?! The same for me too Appu :). Happy u like it, thanks! Hey Rashmi, oh so ur a big fan of hers....good. Thank u blink blink ~.~ lol. Bye bye..
thats amazing and what a creative post! so following u ! !